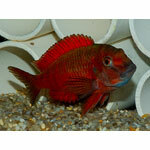 Fire Cracker Tropheus Kasanga has a protruding dorsal fin but some fish may show a blue dorsal. 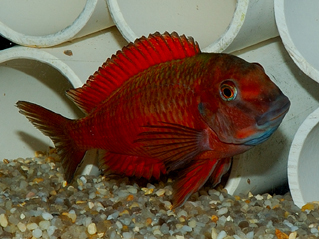 Their aggressive conspecific behavior, their temperament in the tank along with their tendency to catch "bloat" or internal parasite makes the red rainbow a real challenge, these cichlids should be kept only by experienced fish keepers.A school of 12 or more Red rainbow kasanga can make an astonishing display. 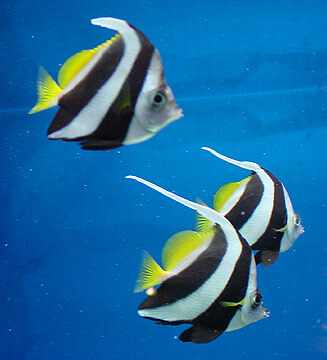 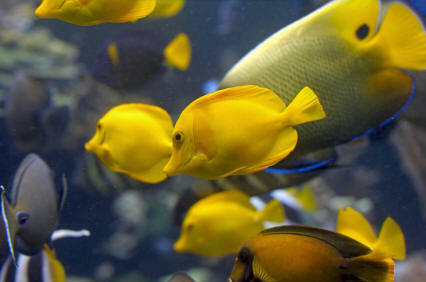 Tropheus are an aggressive cichlid towards others of its own species so should be kept in groups of 6 or more preferably in a species aquarium.